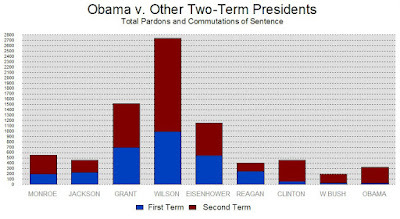 President Obama has granted 61 commutations of sentence. He has now granted 70 pardons and 248 commutations. White House counsel W. Neil Eggleston walked out the tiresome straw horse, noting: “Clemency of individual cases alone cannot fix decades of overly punitive sentencing policies" - a position that, quite literally, no one, anywhere, on the face of the entire earth, holds. Will you publicly apologize to Obama for your nasty Washington Post column earlier this month?